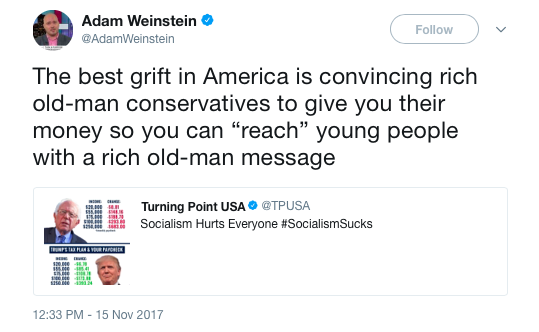 Turning Point USA tweets that critic namd “Weinstein” has his hand in other people’s pockets. 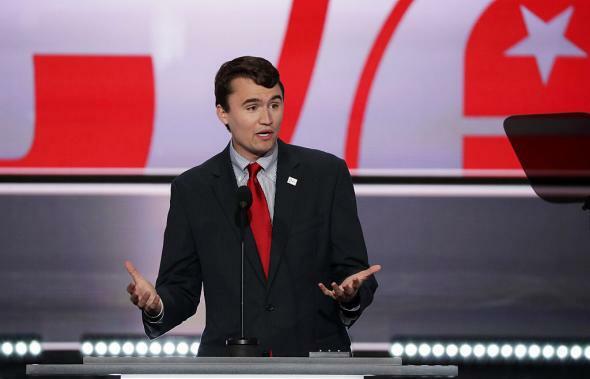 Charlie Kirk, founder of Turning Point USA, at the Republican National Convention in Cleveland on July 18, 2016. 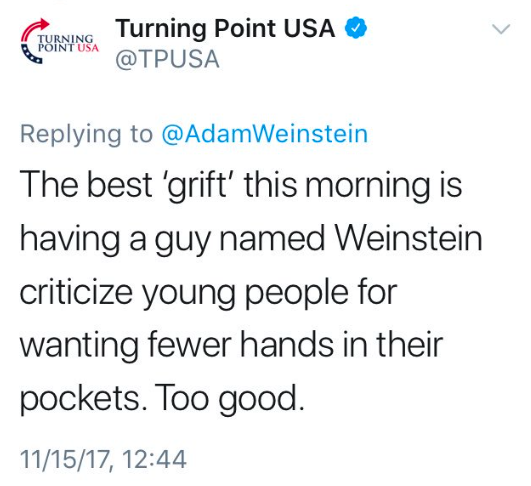 Turning Point subsequently deleted the tweet and apologized to Weinstein, making the claim that its joke—which was about putting one’s hand in someone else’s pocket in the context of a tweet about money and “grift”—was not a play on anti-Semitic stereotypes about greed but in fact a reference to Harvey Weinstein. A reply from our account had a joke made in poor taste referencing Harvey Weinstein. The incident has been deleted & handled. We apologize to anyone who read the tweet as derogatory in any other way. We hope to continue positive dialogue in the fight against big government! Hmm. Could be that. Or it could be that, for some reason, right-wing groups currently feel emboldened to use crudely bigoted rhetoric in a way they wouldn’t have a few years ago. One or the other!